This is a story of a young albino girl named Lily whose mother felt was a monster. This young girl was kept in the attic of her home - locked away from the world - until she was 10 years old. At that time, her mother snuck her out into the night and sold her to the circus that was visiting town. For the next decade, Lily was part of the circus. First in the freak show, and soon working with the elephants. She had a gift with animals that no one had ever seen. 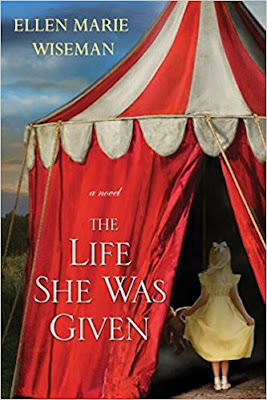 She never saw her mother or father again, and the circus became her family. The other half of this story is about a girl named Julia. Several decades into the future from Lily's story, Julia has come home to settle her parents affairs. Her mother has recently died and left the house and a horse farm to Julia. Julia- who was never close with her alcoholic father and God fearing mother - comes home to find that there are several secrets her parents kept from her. As she tries to piece together her parent's past, she discovers a secret about herself. This was an okay book. The story was really depressing from beginning to end. The writing was only fair. There is a big twist in this book, but it is easy to figure out pretty early in the book. The characters were not well developed. I never really saw Lily grow up in the book, even though the book covers almost a decade of her life. The ending seemed to wrap up quickly without much depth. I would say skip it. I did not find it an enjoyable read.